03/21/15 – STIMULATE: Xris SMack! Blacklight Birthday Bash! w/STATIQBLOOM, JUSTIN SYMBOL, THE HORRORIST DJ Set, LIFE CRIED CD Release Party +more! STIMULATE: Xris SMack! Blacklight Birthday Bash! w/STATIQBLOOM, JUSTIN SYMBOL, THE HORRORIST DJ Set, LIFE CRIED CD Release Party +more! STIMULATE 3/21: Xris SMack! Blacklight Birthday Bash! w/STATIQBLOOM, JUSTIN SYMBOL, THE HORRORIST DJ Set, LIFE CRIED CD Release Party +more! 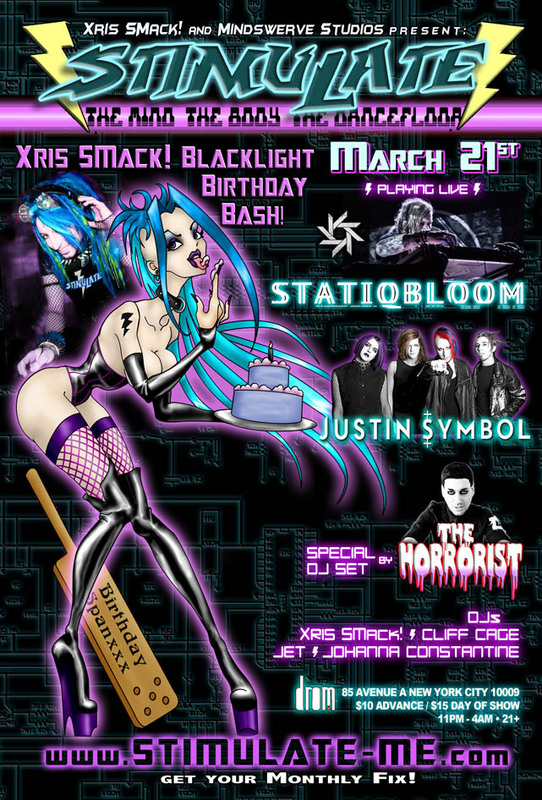 S T I M U L A T E: Xris SMack!’s Blacklight Birthday Bash! wear your UV Reactive / Neon clothes or body paint - the club will be bathed in Blacklight! Pain, Terror, Destruction and Madness ! for over a decade The Horrorist has spread his dark electronic manifesto: ranging from Minimalist beats, Synthpunk, techno with eerie Vocals, characterized by club hit "One Night in New York City". He runs Things To Come Records, and has released over 70 12" singles. his infamous live performances have titilated audiences the world over. * XRIS SMack! - Special Birthday Set! LIFE CRIED - "If I Don't Wake Up"
Nola Bunny, Lulu Kramer, Luna Llena, Elena Bretanova and more! Oral STIMULATION from our Resident Treatmaker and “Cupcake Queen” ANNABEL EVIL ! and there will be BIRTHDAY CAKE! * 4/16: STIMULATE + CYBERTRON present COVENANT on their North American Tour! * 5/30: SMack! 19 Year Anniversary! UV Reactive / Neon / Blacklight clothing or Bodypaint - Be Creative! Make an Effort! Andy Tang, Father Jeff, Dr. Avi, Lydia Vengeance, W.H. Muse, Mistress Katya and more…. let us know if you have a birthday this month! our Door Queen: Mandana Everywhere!